Black-necked Stilt (Himantopus mexicanus) from Merritt Island National Wildlife Refuge, one of the must-visit birding hot spots in USA! 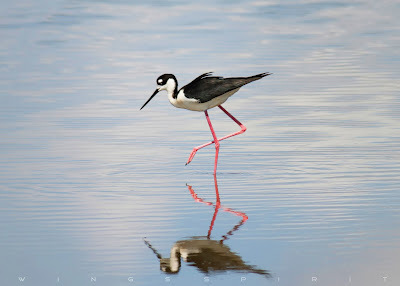 Black-necked Stilt has the second-longest legs in proportion to the bodily length of any bird, exceeds only by flemingos. They live in shallow wetlands from western United States to central America. You might spot them in the east coast and southern Florida in summer. They migrate to their breeding ground from March to May, lay eggs on ground and migrate back to central and southern America in the late July. Black-necked Stilt. Photographed in Merritt Island NWR, Florida. Click image to enlarge.